This quote about characters played by the late actor came from Claire Dederer in Salon. Quoted, in turn, by Washington Post writers Terence McArdle and DeNeen Brown. 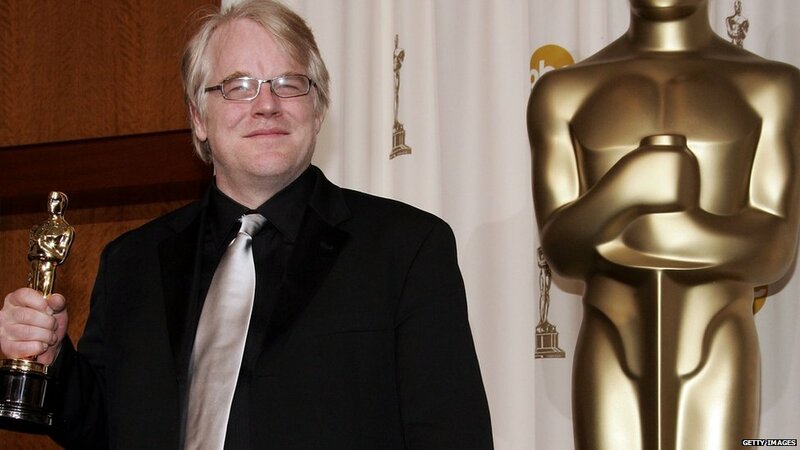 Reportedly Philip Seymour Hoffman was found dead with a syringe in his arm and about 50 bags of heroin. Hoffman won the Best Actor Academy Award in 2006, lauded for playing the title role in Capote. Last year he admitted that 20 years after recovery from a heroin addiction, he was struggling again with a heroin habit. I’m reading this extraordinary actor out of respect and also because of the drug-taking aspect. Some of you regular Blog-Buddies know that one of the threads we research here occasionally is what deeper perception reveals about the impact of addictive drugs on consciousness, researching at the subconscious level through techniques of Stage Three Energetic Literacy. More background can be found at the end of today’s article, including links to the comparison photographs used for this research of chakra databanks, or nadis, within the actor’s energy field. What was going on deep within him at two very different times in his life? Incidentally, the more recent photo of Hoffman is quite disturbing. If you know you are an empath and you also know you haven’t gained pretty dependable skills as an empath, don’t even open up the photo links supplied below to the more recent photograph. Reading this one is going to be quite messy due to content. While just reading my description? That’s just information, not upsetting beyond the content. And, I’m hoping, beyond providing insight, this comparison aura reading will be informative about what can happen as a result of taking recreational drugs, the impact specifically of heroin. Even with Stage One Energetic Literacy, you can read a snapshot of the horror and compelling other-worldly attraction of Hoffman’s consciousness as a heroin addict. 12 feet. Smashed, repaired. The shattered components of relating to physical reality have been splintered in the most spiritually and emotionally painful way imaginable. Then Philip Seymour Hoffman has reconstructed a facsimile of normal functioning in this chakra databank. An astounding work of the intellect and a brave, dogged use of creativity, putting himself back together again. This reads like an intellectually-oriented Triumph Tale of a Humpty Dumpty. Of course, Philip Seymour Hoffman had gone through a drug-filled, alcohol heavy passage into adulthood. In one of the articles on him I’ve seen, or perhaps the interview I heard today with Terry Gross, Hoffman said that if he had been successful and wealthy by age 19, he would have died of an overdose…. Rehabilitation and recovery from drug use is such a courageous path, so difficult, so evolutionary in certain ways. Right away, how I admire this man! Out to the moon. Philip Hoffman no longer resides on earth. He lives on an astral realm within human frequencies. This frequency where he resides in consciousness, speaks and acts? It is easily mistaken for human life when folks don’t have access to drugs or if somebody is using skills of energetic literacy. The monsters are back in his life. These are demonic astral presences that come and go without warning, bringing terror. (This aura reader would call this a chemical side effect of coming down off the heroin, plus the impact of all the STUFF that gets slammed into his energy field every time he gets high and comes down — frozen blocks, mostly, but also contents in cords of attachment, terrifying thought forms, and psychic coercion deposits as if on steroids. The heroin high reality — the astral level to which the drug takes Philip Seymour Hoffman — is like his true love. Reunited now, he never wants to part. 40 feet. Physically tough. Strong and rugged with his nervous system. When it comes to his sensuality, there is a love of being in a human body and enjoyment of feeling healthy. As an empath coach, it is my impression that most people who know about empaths and Highly Sensitive Persons (HSPs) make an assumption about a mega-talented actor like Philip Seymour Hoffman. It is assumed that he must be an empath. Or at least one of the 3 in 4 HSPs who is NOT wired for life as an empath. I don’t think so. Not a Highly Sensitive Person but a brilliantly brainy, highly intellectual person in a body that is built like a tank, for endurance. Hatred of the physical body goes unquestioned. This aura reader won’t question it either, how such a physically talented and once robust man could come to loathe his body. I’m not surprised because, sadly, when somebody mostly lives in an astral frequency in consciousness, there is quite a hatred of that bit of physical human substance that must be fed, clothed, etc. It feels like the body is the last thing to stand in the way of his high. Philip Hoffman’s body has become, to him, The Great Betrayer. It keeps bringing him down, again and again. There seems to be no escape, except getting as high as possible as often as possible. 45 miles. Does that man ever feel comfortable with using his power, with mobilizing it to push through obstacles. Yet again, the quality in one of Philip Hoffman’s chakra databanks just reminds me of a tank. Anger is very easily accessed — and then hidden — by this man. By this time in his emotional development, seems to me, anger has become Philip Seymour Hoffman’s best friend. 14 inches. Such weariness! Why bother trying to solve problems now? Human life seems to be beyond stupid. No words of loathing for life on earth can do justice to his animosity towards those low, slow, stupid human frequencies. 7 inches of twisty-turney, fascinating, intellectualized versions of having human emotions. His emotions. His ideas about his own emotions. Listening to the Terri Gross interview today, I heard him tell the cleverest little prevarication. Seems to me. The Queen of “Fresh Air” asked if he had ever been in psychotherapy and, if so, if this had impacted him how he worked as an actor. Twice he said that he had never been in psychotherapy about how to be an actor. Cute! It must be hard to be a highly successful actor and keep anything private in life. If Hoffman hadn’t been a major public figure, I wouldn’t be publishing today’s aura reading! Still…. I don’t know too much about the recovery process for heroin addicts, but suspect that psychotherapy is involved pretty often. Certainly this Heart Chakra Databank for Emotional Self-Awareness is riddled with riddles, intellectualizations, theories, and many a twisty-turny-twirly attempt to explain (and thus neutralize) the horror of spontaneous, uncontrolled emotions. 7 inches. Human emotionality is a distant, vague, nauseating memory. Like a recurring nightmare (during waking hours) from which he can never awake. At least, until a heroin high brings him away from the disgusting dream world that human awareness appears to be. To him, now so clearly an addict, caught in the thrilling death dance as the addiction more and more claims him. Out to the moon. The astral is his love. Which form of the astral? Quite likely this is related to where he used to travel on heroin, before recovery. What is evident in this chakra databank at the time of this photograph? This is the first one I’ve read that feels like authentic, natural, comfortable Philip Seymour Hoffman. Self-acceptance and flow abound. What is completely missing? Self-consciousness. Trying to use his whip-smart intellect to smack ordinary human reality into submission. Of course, this chakra databank isn’t about human reality. It’s about astral/psychic experiences. Feels like home to him, his true home, even while living in exile. I am stunned by the struggle he would have undergone daily, withholding this friendlier mock-paradise by staying clean and sober. And more than ever, how I wish to graduate so many from the Mentoring Program in Rosetree Energy Spirituality, some of us can begin to specialize in addictions work, moving out STUFF that keeps people like this brilliant and brave man locked in daily struggle. Out to the moon. The astral is now solid, like human. While all the other chakra databanks I’ve read so far are more like life seen through brown glass, vague and not quite real. The flip is complete, the Do-si-do dance accomplished. Philip Hoffman has taken up residence in his astral comfort zone. Only this life is solidly real to him now. 1 inch. Gunked up, gummed up. Anything related to the Divine seems inaccessible as a forbidden fortress. At least until the person moves out related STUFF. Yet one more reason to admire Philip Hoffman. Even with this exile-like experience, disconnected from subconscious connection to the Divine within himself and life’s energies, the great actor persisted in taking life one day at a time. 1 inch. Gummed shut, very much like in the earlier photo after being clean and sober, yet still aurically scarred from previous drug use. Except one thing has changed. Astral beings — Philip’s companions in this new astral-based life he has moved into — astral entities with a demonic malevolence are especially strong in this chakra databank (although I have encountered them also when reading his Solar Plexus Chakra Databank for Handling Conflict. Information about Aura Reading Through All Your Senses(R). Philip Seymour Hoffman with a heroin habit, a photo link to the original source, an article in Philly.com. Philip Seymour Hoffman in recovery, a photo link to the original source, an article from the British Broadcasting Company. The photograph at the top of today’s aura reading of Philip Seymour Hoffman was created by Rita Molnár 2002. This file has been extracted from another image: File:Sandler-Anderson-Watson-Hoffman(Cannes2002).jpg. Thanks Rose. I was hoping you would do an aura reading of Philip Seymore Hoffman. Although, what a very sad reading it is. I hope that day, when Rosetree energy spirituality graduates specialize in addictions work, and “rehab” actually involves healing. Poor man. Eyes well aware of being caught in a fatal mistake. Wow is all I can say Rose. Such talent and such a difficult, harrowing path. I wondered about him several times today after reading his story, but did not in any way want to do even the magic picture technique with some of the more recent pictures I saw splashed across the net. I decided to be very cautious instead. Rose thank you so much for this fascinating aura reading. I was always a huge fan of his. He was such a talented and wonderful actor. What an amazing reading, Rose! I was hoping you’d do a reading on him once I heard the sad news of his death. Such a loss! Such talent…. After reading this, I was struck by just how important it has been in my own Energy Spirituality education to learn about the difference between the astral and the divine. The following sentence from the reading has me wondering if this relationship with astral presences is different from what would be described as being possessed and needing an exorcism. My impression from the reading is that the connection with these astral presences is somehow different from having an entity lodged in one’s aura. Or is it exactly that? It’s awful either way, but now I’m curious about the distinction, if there is one. Rose, Thank you so much for this very informative aura reading. I hope you will write more about the entities and STUFF that come in with various types of addictions and how (if so) they differ. He’s been researching this issue for a book for some time– he talks about how there is an epidemic of heroine addiction in white middle class communities, and how it got a spark from the widespread use of prescription medications such as oxycontin. And the entities– I very much hope you will blog more about them and in particular, how and why they attach to one chakra as opposed to another. And what causes / prompts them to move on. Ah I feel so sorry for the man to die that way. I’ve never been a heroin addict, but I know what it means to be an addict and to feel that the object of addiction is true love. I also know how that cuts off all connection to God. Addiction is spiritual shutdown in my experience. How tragic that he couldn’t find a connection to God through the recovery process that could help him release the need for that false love. What a loss for him and for his three children. Thanks for doing this. Pretty incredible. Ay-May-Zing, as usual Rose. He had the effect of elevating every scene he was in, and lifting the “game” of his co-stars. You can see it in The Hunger Games: Catching Fire, where he played the Game Maker — a double-agent with a completely convincing straight faced lie in his scenes with the president of Panem. Makes me wonder if he relapsed before filming began, or after it started, and whether his habit informed the duplicitous character he had to play. I saw this article this morning and it struck me how the root of the drug problem is a misunderstanding of what’s really going on in addiction. It would be so interesting to get your take on his paradigm, Rose. I look forward to whatever you write on this very important subject of addiction and the human energy field. An excellent actor indeed. Yes, there’s a picture I won’t be looking at until there’s more skill. Thanks for the detailed perspective. It give a much more real example of why someone might be drawn back into something so dreadful. Have had experiences with ‘demons’ but I’ll wait for Rose to comment more on that one. But I’d emphasize the magnetize part. Who shows up depends on the energy we broadcast. Light keeps it clean. As Rose noted, the dark side hates it. Re the Seth Roberts post on situation-drug associations (mentioned above). I was just checking Australian psychic Robert Bruce’s book on protection which mentions that negative entities don’t travel well in the “real time zone.” He writes, “They need to settle into an area before they can do anything serious…. they often cannot easily leave the building in which they are manifesting.” Rose, I would be so interested to know your take on that. Thank you so much, everyone, for these comments. I wrote a pretty thorough new article to respond to some of them. KYLIE, regarding your Comment #2, I do share your hope. Poignant and powerful, thank you Rose. As a recovering addict, though my drug of choice was not heroin, I have known many in the seventeen years since I stopped using drugs- heard their stories, been close as friends and lovers, witnessed all stages of active addiction and recovery, and this reading could not be more true. ISABELLE, you are so welcome. I found your comment to be poignant and powerful. It was interesting to me because I’ve heard people say that line a lot about how loving others should be enough to help people change. I was glad the specialist spoke out against that. But certainly it seems like addicts’ recovery/healing could be easier (not easy of course) with Rosetree Energy Spirituality. DANA, such a good point. How can loving others melt away subconscious, astral-level STUFF? Neither recovery from substance abuse nor spiritual evolution toward Enlightenment is that simplistic. It is Part Two of a series about helping people with today’s technologies of energy spirituality, so different from older methods to help with recovery… important work, but so limited (I think) by the lack of energetic literacy, or techniques that require being able to read a person’s aura in enough detail to determine what, really, is driving the addiction and how to heal it. ROSANNA TUFTS, thank you for raising the theme of duplicity. Hiding and secrecy can happen for so many reasons. They can cover up problems in so many ways. I thought it could be helpful to clarify how I seek out the hidden problems that torment a client in recovery. Or anyone else who comes, whether tormented or simply self-actualizing. OK, I found out that he relapsed in May of last year, after filming had wrapped on “Catching Fire.” So he was still on top and in control then. But for the two “Mockingjay” films, he was back in the grip of addiction. Part 1 will be released later this year, and we will see then, whether his onscreen performance was affected. I heard that he had finished filming all his scenes for both films, except one. That scene will have to be rewritten so that other characters have the lines that were originally intended for his character.